The 1000 thread count of Egyptian cotton is what bedding is supposed to be, inviting and comforting, welcoming you to bed. If you know anything about bedding, you know the importance of a high thread count as well as the Egyptian cotton designation. This sheet set has been created with all bed types in mind with an ability to fit up to an 18-inch mattress for those who can’t live without a nice pillow top. It also has elastic reinforcement all the way around the sheet to make sure it stays put once you put it on the bed. These are at a great price for a sheet set of this thread count. They are very soft sheets that will help you enjoy a good night’s sleep. They are made to fit beds that are normal size or larger, pillow top mattresses. The 1000 thread count is deceiving, as they don’t feel as luxurious as you may expect for this thread count but the are nice and heavy. They are wrinkly, even right out of the dryer. You will have to iron these if wrinkles bother you and you want them looking crisp. As you may expect, Egyptian cotton comes from Egypt. It is generally grown along the Nile River Valley, the plants nourished by the waters of the Nile. How is it different from other cotton? You may think cotton is cotton, right? Wrong. When it comes to Egyptian cotton, there are some differences. The main one is the fact that it is an extra long staple cotton. That means the fibers from the cotton plant are longer than other cottons. Longer staples can be woven into thinner pieces of thread and that will allow more pieces of thread per square inch (thread count). While you may think the thinner thread that comes from Egyptian cotton would not be as strong as thicker threads, you would be wrong. As a matter of fact, the thread is much stronger than many other threads out there so you know Egyptian cotton items will last longer than many other cloth types. As a matter of fact, properly cared for Egyptian cotton bedding items can last for decades. Unlike other sheet sets that seem to become more uncomfortable over time, Egyptian cotton bedding items are quite the opposite. When you first get them they are about as harsh as they will be for the life of the bedding. Every time you wash them, they will get softer and softer making you feel rewarded immediately for doing your housework. Egyptian cotton is also able to hold color better than other cotton types. It is a very absorbent fiber, which means as it is dyed, it will take in more of the color in the dye vat. This absorbency also means that if you have towels or robes made out of Egyptian cotton they will pull water from your body quickly as well. Egyptian cotton does cost more than other cotton made pieces out there, but you have to understand the long-term cost of any purchase you make. Over the long term, these pieces will likely outlast your other bedding and towel purchases, possibly by 5 – 10 years, making them economical in the long run. 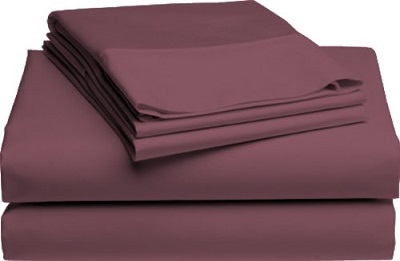 This 800 Thread Count Queen Sheet Set received excellent ratings from consumers on the internet with the majority of comments positive and with ratings of 5 stars. was described by the favorable reviewers as soft and a great quality for a fair price. This product was compared favorably by the majority to similar sheets at a popular department store, because it came in much cheaper. A positive surprise shared was the heavy feel of these sheets. These reviewers also commented that even with the heavy feel the material was still breathable enough to ensure a very comfortable night’s rest. This product is also described as standing up very well to frequent washings and retaining its vibrant color. Per one reviewer, the LinenSpa sheets also stood up well to cats racing across them with extended claws. She feels comfortable enough allowing her cats into the bed because of the durability of this product. One customer however advised against using these sheets in the summer because of the heavy feel. Another person was a little disappointed that the color in person was darker than what the picture showed. 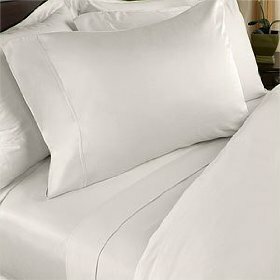 Two reviewers felt misled by the term “sateen” and think that the product description promises a more superior sheet set than they received. One also feels they were inferior to a product of lower thread count from a good department store. There was also a problem mentioned that even though they are advertised to fit an 18″ mattress, it did not even fit on the consumer’s 16″ mattress. Nonetheless, even the reviewers who had negative feedback did not rate these sheets lower than a 3, which brings the average rating for this product to an outstanding 4.5 stars. 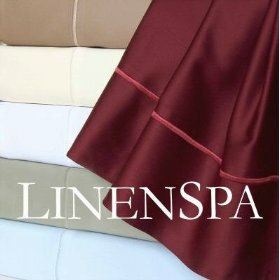 Fitting most mattresses up to 22” deep, this oversized sheet set from LinenSpa is made from 600-thread-count 100% long-staple Egyptian cotton sateen and comes with a flat sheet, a fitted sheet and two matching pillowcases. 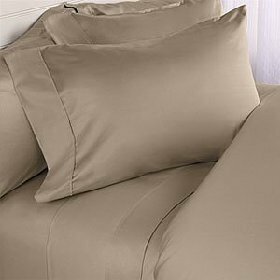 Available in an array of soft colors, including white, sage, mocha, blue, wine and khaki, the sheet set comes in various sizes that range from twin to California-king. Most customers who purchased the sheet set and reviewed the product online were very pleased with the overall quality and were especially surprised by their durability. According to website reviews, even after several washes, the sheets still retain their same color and texture and show few signs of wear and tear. Though many described the set as thick and heavy, most reviews noted that the sheets were also incredibly soft and luxurious and ideal for warm summer days. While the price of the sheet set ranges depending on the size you choose, most stores and websites sell the product for less than $200, which is relatively inexpensive compared to other sheet sets of the same quality. Many customers who reviewed the set noted that they were so pleased with the product and price, that they bought another set in a different color for their own bed or as a gift for a loved one. The only complaint customers have about the set is that they often smell like glue when they first come out of the package. However, after a quick wash, they advise that the smell is gone and the sheets are softer than ever. Where Can I Buy the LinenSpa 22″ 600 Thread Count Egyptian Cotton Bed Sheet Set? We are all aware of Rachael Ray through her TV show, cookbook and her fantastic cookware and kitchen appliance. Well, Rachael has turned her hand to providing a line of home furnishings and bedding that are beautiful. 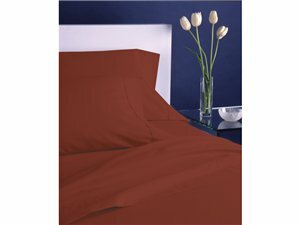 This boldly colored Rachael Ray Solid Sheet Set – Paprika is just one of the lovely sheet sets available. You can bring the style of five-star living to your home with these exceptional 100 Egyptian Cotton bed linens. The rich and warm tones will bring a touch of elegance and luxury to your bedroom. Available in both king and queen sizes this sheet set is designed to coordinate with Rachael Ray’s bedding. Coordinating comforter and bedding accessories are sold separately. Buy Now the Rachael Ray Solid Sheet Set – Paprika? You will love the feel of these Pinzon Luxury 400-Thread Count Egyptian Cotton Sheet Set . The 400 thread count combined with the fact that these are 100% Egyptian cotton makes those soft and luxurious. 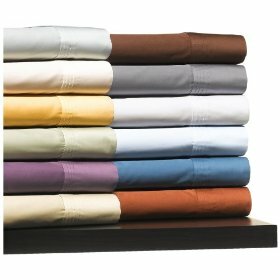 This sheet set is available in an amazing range of colors including white, plum, sage, platinum, ivory, sand, spice, maize, sky blue, espresso, silver sage and marine. You won’t have a problem finding something to match your bedroom decor with this range. This sheet set is available in king, California king and queen and are fully machine washable. Not long ago I purchased a set of 1000 thread count, Egyptian cotton bed sheets and believe me there is nothing that compares to slipping in between their luxuriously silky texture. And believe me, when you wrap yourself in this 1000 thread count Egyptian Cotton Sheet Set you will appreciate the comfort, softness and pure opulence that you will experience. The set is made from the long staple Giza cotton that is grown in the Nile River Valley, where it has been grown since the time of the Pharaohs. I find that my 1000 thread count Egyptian Cotton sheets seem to become softer with each wash, I just love how the sheets feel. 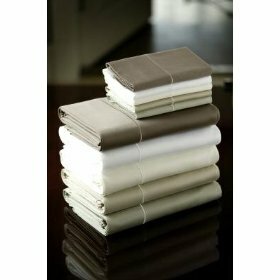 Where Can I Buy the 1000 Thread Count Egyptian Cotton Sheet Set – 1000 TC California King Sheet Set?